There are diverse linkages between climate change and security including risks of conflict, national security concerns, critical national infrastructure, geo-political rivalries and threats to human security. We review analysis of these domains from primary research and from policy prescriptive and advocacy sources. We conclude that much analysis over-emphasises deterministic mechanisms between climate change and security. Yet the climate-security nexus is more complex than it appears and requires attention from across the social sciences. We review the robustness of present social sciences analysis in assessing the causes and consequences of climate change on human security, and identify new areas of research. These new areas include the need to analyse the absence of conflict in the face of climate risks and the need to expand the range of issues accounted for in analysis of climate and security including the impacts of mitigation response on domains of security. We argue for the necessity of robust theories that explain causality and associations, and the need to include theories of asymmetric power relations in explaining security dimensions. We also highlight the dilemmas of how observations and historical analysis of climate and security dimensions may be limited as the climate changes in ways that present regions with unprecedented climate risks. 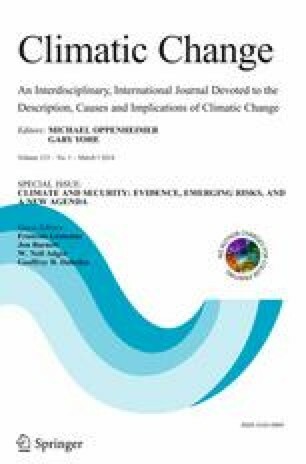 This article is part of a Special Issue on “Climate and Security: Evidence, Emerging Risks, and a New Agenda” edited by François Gemenne, Neil Adger, Jon Barnett, and Geoff Dabelko.